Health and care services are being transformed at a rapid rate. There are many initiatives at the moment. KCSC will be running a workshop on 27th October to bring the voluntary sector up-do-date (invitation to follow). Keep an eye on our website as we will be publishing information there shortly and updating it regularly. This is the first of a short series of 'bite size' emails to give you a flavour of the key documents and changes coming up and provide links to further information. Every health and care system in England will produce a multi-year Sustainability and Transformation Plan (STP), showing how local services will evolve and become sustainable over the next five years. The plan involves an approach where patients take more control, with the default position being to provide care in areas close to people’s homes, wherever possible. The STP plan puts more emphasis on the wider determinants of health and radically upgrades prevention and wellbeing. This should create opportunities for voluntary organisations as there will be more emphasis on prevention and self-care throughout the system. The STP explicitly addresses the NHS funding gap of £1,154m and social care funding gap of £145m by 20/21, in a ‘do nothing’ scenario. It specifically states the need to protect and invest in social care and in preventative services, to reduce demand on the NHS and to support the shift towards more proactive, out of hospital care. It proposes an investment in prevention and social care, savings in acute services, and a shift from acute to local care settings and prevention. There will be a focus on social isolation as a key determinant of physical and mental health, whether for older people, single parents or other vulnerable groups. 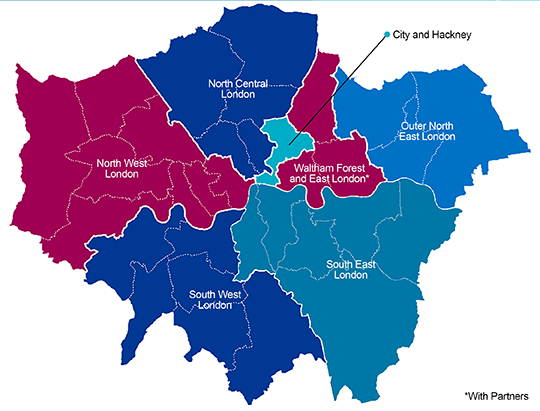 CWHHE = Central London, West London, Hammersmith and Fulham, Hounslow and Ealing CCG. 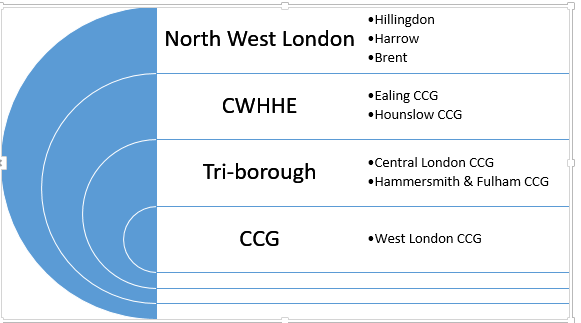 CCG = Clinical Commissioning Group.